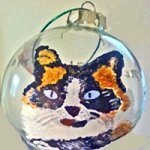 People love their pets, and we would love to capture your fiesty dog or cat on dog ornaments and cat ornaments are hand painted with or without a Christmas theme, We will paint whatever breed you like. Our dogs and cats rely on us for their well being, and we so readily accomodate as they are part of the family. They provide so much joy and comfort to us that we just have to put your pets on your personalized dog ornaments or cat Christmas ornaments to hang on the tree. What a unique gift to give someone when their dog or cat means everything to them. Older people, especially would love this. Send a picture by email or mail me a picture which will be returned with your order. 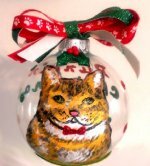 We will hand paint the unique likeness of your dog or cat on dog ornaments hand painted, and cat ornaments hand painted with their names and dates. As you look at the various custom pet ornaments if you don't see your breed no problem. Just request it on any of the Christmas pet ornaments in the Special Request Box. Our customers love our pet ornaments and keep coming back to order for other family members and friends. Someone is always getting a new pet and what a great gift to give at Christmas time or anytime. Which pet would you like for us to hand paint?